Coming off their first place victory in the judge's category at this May's Elk Grove Old Town Chili Cook Festival, the Elk Grove-based team of Notorious P.I.G. team competed this weekend at the International Chili Cook-off held at the Grand Sierra Resort in Reno. 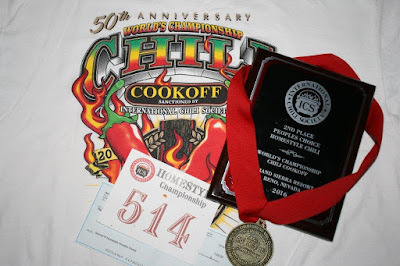 Sponsored by the International Chili Society, the global competition saw cooks from around the world compete in several categories including red chili, chili verde, homestyle, and salsa. Notorious P.I.G. competed in Friday's homestyle category. Their entry, Tampico Trauma Chili won second place in the People's Choice category and earned the team $200 in prize money. The first prize winner in the People's Choice was another Elk Grove Chili Cook Festival contestant, Sacramento-based Mark Groth, whose Wow Wow Chili came in first place in the People's Choice and earning that team $300. In addition to winning in the People's Choice category, the Notorious P.I.G. 's entry also was placed in the Top 10 out of 64 teams in the Judge's category. The Notorious P.I.G. team members include Elk Grove residents Jack Lee, Kathy Lee, Steve Lee, and Marieza Calip.